Written by Admin on March 31, 2019 . Posted in News. H.E. Mr Savankhone Razmountry, Deputy Minister of Information, Culture and Tourism of the Lao PDR, and President of the Laos Journalists Association, this morning presided over the opening of the Board of Directors Meeting of the Confederation of ASEAN Journalists (CAJ) in Vientiane. The meeting, which is being held at the office of Vientiane Times, is hosted by the Laos Journalists Association. 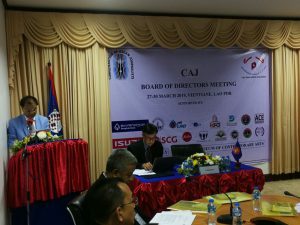 The meeting will review the work done under the Action Plan 2018-2020 adopted at the 19th General Assembly of CAJ in Bangkok in January, 2018, with an aim of strengthening cooperation among CAJ member countries and enhancing the solidarity and cohesion among journalists and media organizations within the ASEAN Community. 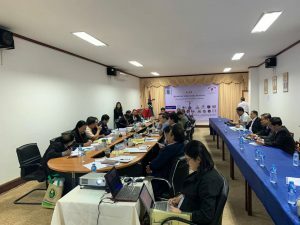 Under the Action Plan, Lao Journalists Association (LJA) and Confederation of Thai Journalists (CTJ) jointly organized a working visit for journalists from CAJ member countries in March, 2018 and which has successfully contributed to promoting better understanding among ASEAN countries through tourism. Besides, CTJ and CAJ also worked work with Thailand’s On-line News Providers Association (SONP) to organize a regional forum on the issue of “fake news” and the role of professional media in dealing with the challenge in Bangkok in August, 2018. 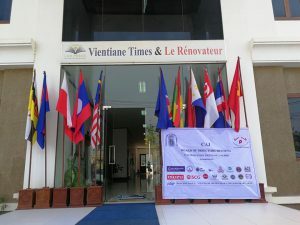 Thepchai Yong, President of CAJ, said the meeting in Vientiane will discuss progress made under the Action Plan and new initiatives for the remaining term of the current CAJ Presidency and Board of Directors. “The role of the media is becoming increasingly important in this fast-changing world which is facing unprecedented challenges. The media in this region need to have closer cooperation, share their experience and ideas so that we can face these challenges together,” he said. Thepchai also thanked the Laos Journalists Association for hosting the meeting. “We sincerely appreciate the efforts and hospitality of our LJA friends in hosting this very important event which is a great contribution to media development in the region,” he said. Taking part in the BOD meeting are presidents and representatives of CAJ member countries. They are the Laos Journalists Association, National Union of Journalists Malaysia, National Press Club of the Philippines, Vietnam Journalists Association, Confederation of Thai Journalists, Club of Cambodia Journalists, and Indonesian Journalists Association (PWI). Myanmar Journalists Association also attend the meeting as observer. The CAJ delegates are also scheduled to make a courtesy call on H.E.Prof. Dr.Bosangkham Vongdara, Minister of Information, Culture and Tourism of Lao PDR, and visit Vientiane Museum of Contemporary Arts,Nam Ngum reservoir, and Vientiane Neua High Speed Railway Station. CAJ President Thepchai also expressed appreciation for support given by both state agencies and private companies to the meeting.